vLex works on any browser or device including desktops, tablets and mobile phones. But in order to offer an even better user experience, vLex offers vLex Mobile, a native application for iOS and Android. We know it is important for you to always be up-to-date and able to resolve legal questions that arise at anytime, anywhere. We created vLex mobile specifically to allow you do so. With vLex Mobile we bring all the power of vLex to your smartphone. Download vLex mobile and have access to the most complete legal information consultation tool on the market. Wherever you are, you will have access to the vLex search feature and all of its documents, converting your device into your best ally in keeping you always updated. Personalized news, based on your SmartTopics: Don’t miss out on any legislative changes and save time with SmartTopics. 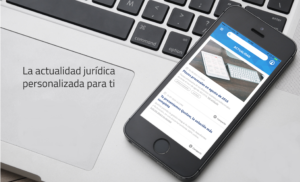 View, in real time, the most relevant documents from a particular legal concept on your smartphone or tablet. View all of the vLex contents available in your plan or open access, including links between documents. Quick access to favorite documents: If you have already marked documents as favorites, you can see them in the vLex Mobile app. Go to the Favorites option in your vLex menu and there you will find your folders. You can also create new folders within the vLex app. 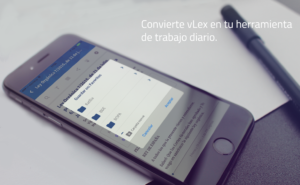 On vLex Mobile you will be able to see all of the content that in available in your plan, whether it be vLex Open, vLex for Professionals, vLex for Academics or vLex for Bar Association Members. Access to documents outside of the plan is still made available through the use of vLex credits. 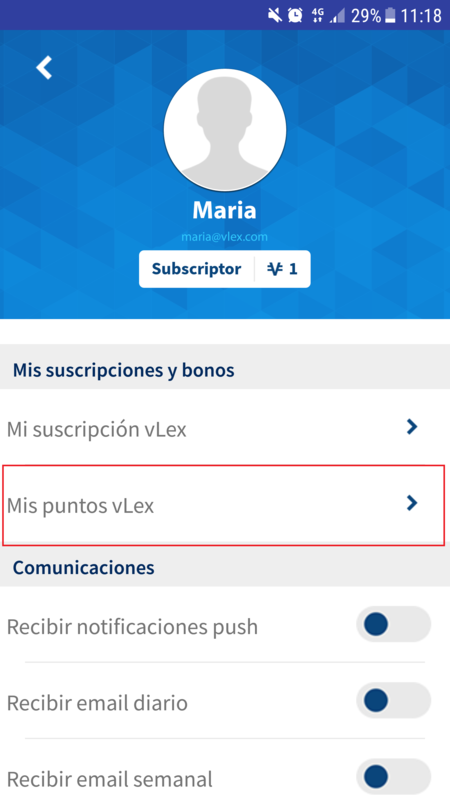 When installing vLex Mobile, remember to use the same e-mail that is associated with your active vLex subscription in order to be able to access the contents from that subscription. If you use a different e-mail, the system will create an Open account that will only have access to the contents included in vLex Open. If your University is a vLex client, remember to use the same e-mail as your personal corporate account (or create a personal corporate account beforehand.) This way you will be able to access vLex from anywhere. How to install vLex Mobile? Available for all users, however not all countries. vLex mobile is available for all subscription plans (free or paid.) It is currently available in Argentina, Chile, Colombia, Spain, Mexico, and Peru. Soon the app will also be available in the United States. Do you want to view content that is not available within your purchased plan? vLex credits allow you to view documents or premium features that are outside of your plan. Go to your profile to see your credits balance or buy new credits by selecting the “My vLex credits” option in the “My subscriptions” section of your profile. The purchase is completed using Google Play (on Android devices) or App Store (on iOS devices), so that you can make your payment securely. The points that you buy in vLex Mobile will be consumed the moment that you access the document. 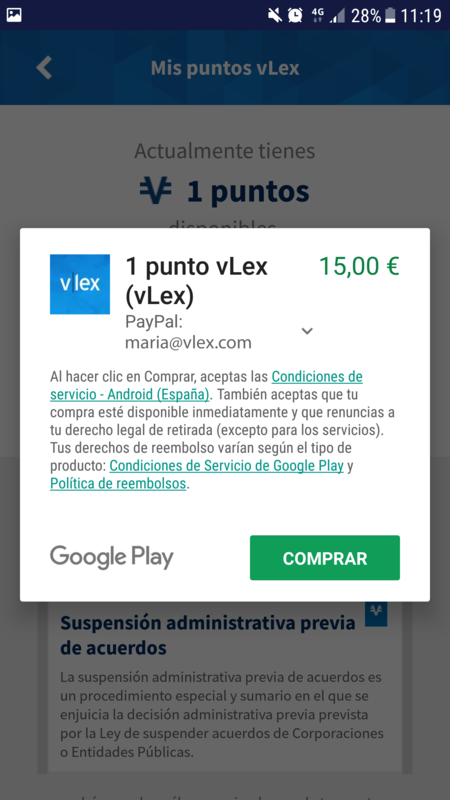 If you have already purchased points from the vLex desktop version, you can also use them in vLex Mobile without having to purchase them again. 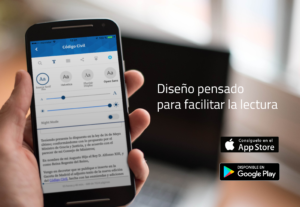 Convert vLex Mobile into your best ally, always keeping you up-to-date on legislative, jurisprudential and doctrinal news. Define your interests through the exclusive SmartTopics feature and let the app show you the latest news specially selected for you. Using the vLex Mobile app you will have access to more than 26 million documents, wherever and whenever you need it. 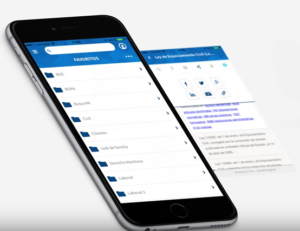 Your folders and favorite documents are synchronized so that you can access them via mobile app, and you can share documents that you have liked by email or on your social networks! Wherever you are, you will have access to the vLex search feature and all of its documents. Thanks to our predictive search and autocomplete, searching on your phone is very simple. vLex Mobile has been specially designed to work on smartphones, this includes features that facilitate reading and the ability to save documents for later consultation offline.